Excellent. Glad to see someone else went with the Painted PCM. Looks great. I did similar in white, but added vent slats in white. I've been searching for ever for a painted PCM car picts. I think it's worth the 2300. LOL.. I hope your overwhelmed with the interior in real life. Looks like you spent a lot of time on the Configurator.. CONGRATS..
How does painted interior look it real life compared to the Configurator picts? Last edited by LateBrake911; 01-16-2014 at 11:07 AM. Well done, love the color. Congrats and enjoy! Nice. You're going to love it. 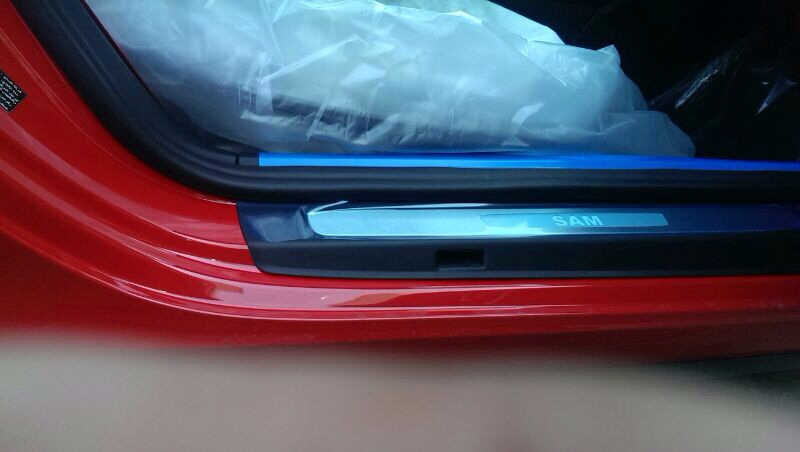 Did you get custom door sill plates? Last edited by smehairbi; 12-31-2013 at 06:55 AM. It will prevent the embarrassment of mistakenly getting in the wrong car. . I dont think you will get in the wrong if you have such a GT3. Love the red color, can't wait to see some pics after you have :unwrapped it! Any idea how i can overcome this??? Cool Sam.. Nice car. I hope I'm the only one in US with painted PCM.. LOL..
See your in Abu Dhabi. I live in Chicago, but had a layover in Abu Dhabi at the YAS F1 Track Hotel coming back from a climbing trip in the Himalayas.. Unarguably the BEST BRUNCH I've ever had w/ view of the F1 track. (can you guys do GT3 track days at the F1 track ? I'll ping you next time I'm in town LOL). Did you get your GT3 picture allocation? Cool Sam.. Nice car. I hope I'm the only one in US with painted PCM.. LOL.. See your in Abu Dhabi. I live in Chicago, but had a layover in Abu Dhabi at the YAS F1 Track Hotel coming back from a climbing trip in the Himalayas.. Unarguably the BEST BRUNCH I've ever had w/ view of the F1 track. (can you guys do GT3 track days at the F1 track ? I'll ping you next time I'm in town LOL). Hahaha ... Lets hope your the only one. Yep I'm from Abu Dhabi actually ... Im glad you liked it at Yas. Yeah the track operators have a great program there ... They've go open track days they also have a porsche drag day organized by the porsche dealer, a drag day, a drift day, a drift school and even a cycling day( people can go the track and cycle for a few hours and do a few laps). Sure thing... Whenever your here just ping me. I hope you enjoy it next time ure here. How can i get the allocaton??? -Near the top of the page, click the QUICK LINKS menu. -then you should have space to add new images..
Lol ... Lets hope so. I am using my iphone so i couldnt free up my archive, will try to do so once i get to a computer and the post some more pics.